Ocean view dining is practically a San Diego tradition! 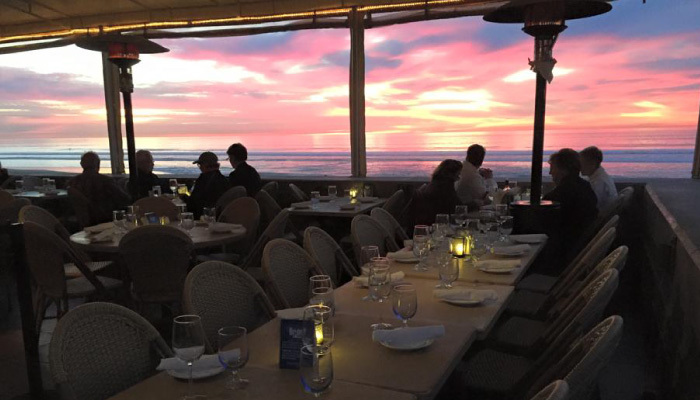 The Poseidon On The Beach Restaurant in beautiful Del Mar blends the ambiance of the beach scene with a relaxed and informal dining atmosphere. Casual by day, romantic by night, the Poseidon offers an amazing array of dishes for every palate, all with a spectacular ocean view! Enjoy the soothing calm of the Pacific Ocean and take in one of the finest sunsets around. Whether you’re celebrating a special event, enjoying a night on the town, or having Sunday brunch, an ocean view is that special ingredient that makes the meal even better. While in Del Mar be sure to explore the charming and historic downtown village. Stroll through the shops and boutiques which offers the latest fashions, collectibles, fine jewelry, artwork and home décor, all with beautiful views of the ocean.